Remember when the holiday season was all about the presents under the tree? That was a long time ago and you have grown up since then and now can truly appreciate the traditions you celebrate during the holiday season. But it can be easy to forget just how precious the moments are when you get caught up in the hustle and bustle of Christmas. In fact, between hours-long shopping sprees and scoring deals on Amazon, perhaps you have forgotten all about Christmas traditions. How about you slow down a bit and put a little more focus on continuing holiday traditions. In fact, there are several you should start, they will make memories that last a lifetime. Momentum AC, your HVAC contractor in Tampa Bay, offers fun family traditions you can start right now. As a matter of fact, you can have Christmas movie night starting the day after Thanksgiving all the way up until Christmas if you so choose. After all, there are so many holiday movies that you can’t possibly watch all of your favorites in just one night. Whether you are watching It’s a Wonderful Life or Die Hard, make sure you pop plenty of popcorn and have refreshing beverages on hand. Just like movie night, there will be a lot of different games family members will want to play. There will always be the classics including Yahtzee, Life and Candy Land. Of course, there are newer games that can be played as well. Again, game night is not complete unless snacks and beverages are served. What makes this holiday tradition so great is that since you can get them in a kit, there is no longer the need to spend hours in the kitchen mixing and baking the gingerbread. Still, the kits offer a lot of fun and the best part is eating your creation. Gather the family in the family vehicle, bring some snacks and a thermos or two of hot chocolate and set out to explore the neighborhood in search of the best holiday light display. It will be hours of fun. You probably have several hundred selfies in your photo collection on your smartphone, but when was the last time you had a family portrait taken? Set an appointment with a photographer and have a family photo taken by a professional. You can use the photo in your annual Christmas letter or in the cards you send out for the holidays. As the years go by, you can look back at all of the family pictures and dwell in the good times and happy memories. The one thing better than a cup of hot chocolate is a hot chocolate bar. You want your hot chocolate bar to include mini marshmallows, whipped cream and colored sprinkles. This is definitely a holiday tradition your family will look forward to every year. 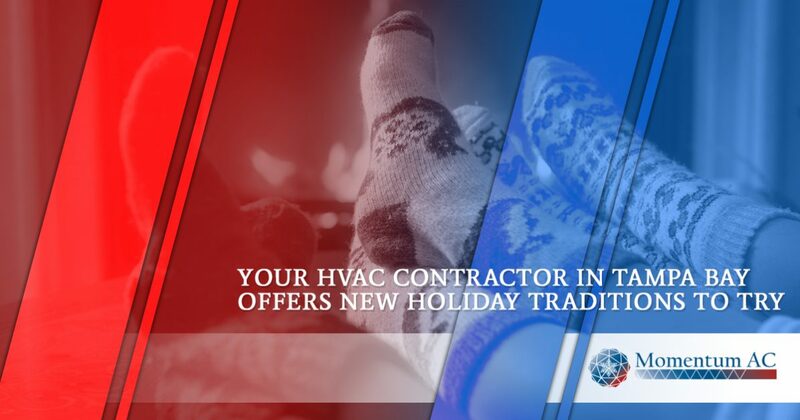 And should you ever suffer an HVAC problem during the holiday season, Momentum AC is here to help. Give us a call.